Shares of Anheuser-Busch (NYSE:BUD) have been tanking. This name has gone on a bender like few investors have seen out of the beverage space lately. Is there still hope for BUD stock, now down 20% for the year? Or does it still need a little time in the drunk tank? Beverage stocks are an interesting group. When the brands are hot and everyone loves them, the stocks can’t be stopped. When that momentum shifts though, they are some of the toughest names to stay long. Boston Beer Company (NYSE:SAM) was like that, surging from $38 in September 2009 to $320 in January 2015. After an almost 10-fold return in six years, shares began to tumble until bottoming near $130 in mid-2017. Diageo (NYSE:DEO) was similar, tripling in four years from its recession lows in 2009. But after drifting lower for a few years, the stock has suddenly been red hot again. The question is, how long will BUD stock stay in its downtrend? Above is a six-year weekly chart for Bud stock. It highlights the prior uptrend than the company enjoyed, shown by the steady trend higher in the 50-week moving average. After a severe breakdown in late-2016 and subsequent rally back to the highs in 2017, Bud’s been trending lower since. For about a year then, Anheuser Busch stock has been struggling. The question is, when will the pain end? Shares are nearing an oversold state and are approaching downtrend support as we speak. That should be good to at least stop the bleeding and maybe even give the stock a boost. However, $95 had been decent support for several years. Now below that mark, I would be concerned that this level will turn into resistance. On a bounce though, $95 would be my first target. 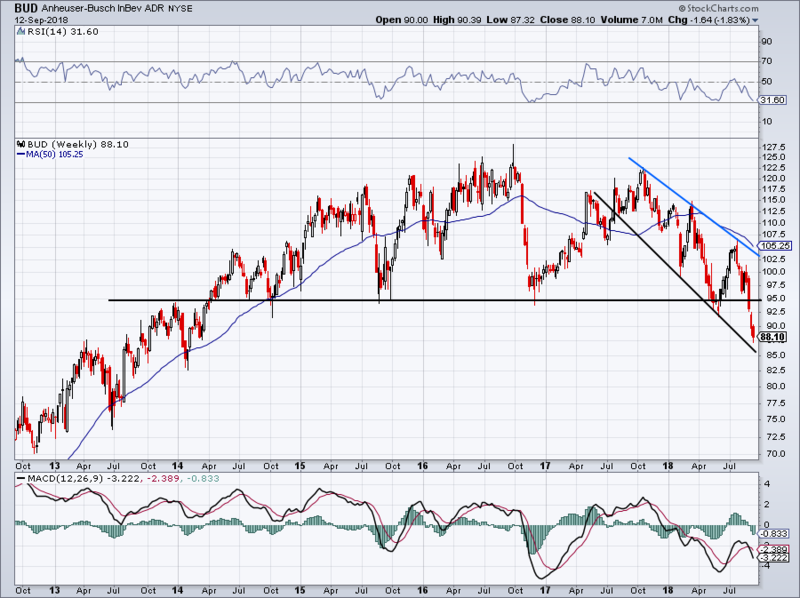 If Bud stock can push through it, downtrend resistance (blue line) will be next. Above this mark and perhaps bulls can go long Anheuser Busch with some confidence. From a technical perspective, Bud is quite similar to Molson Coors Brewing (NYSE:TAP) right now. The valuation doesn’t help matters. Analysts expect earnings to grow 10.5% this year to $4.47 per share. That leaves the stock trading at almost 20 times this year’s earnings. Even though 10.5% earnings growth is good and next year’s expectation for 14% growth is promising, that valuation is high. Especially with the company’s uninspiring revenue growth. Sales are forecast to fall 1.1% this year before hopefully rebounding 2.7% next year. Worries over rising costs threaten to squeeze margins, reducing Bud’s appeal even more. Those who like Bud stock can step into the name near current downtrend support. The dividend yield on BUD is plenty, up near 5%, and should help with the stock’s appeal. Overall, Bud stock has been a dud and its future prospects are only good, not necessarily great. I would rather buy Constellation Brands (NYSE:STZ) for a fair price, given its superior growth and only slightly higher valuation. STZ has been churning out some strong quarters, although the stock has not been reacting favorably. However, its portfolio of beer, wine and spirits, along now with a stake in Canadian cannabis company Canopy Growth (NYSE:CGC) comes off as more attractive. For instance, revenue growth is above 7% this year and next year, with ~9% earnings growth in 2018 and 11.5% growth in 2019. Although, STZ does have a lower dividend yield of just 1.4%. The once do-no-wrong STZ has been struggling this year, down slightly so far in 2018. Perhaps industry-wide, these stocks will be under pressure. See how they handle resistance on the bounces. Bret Kenwell is the manager and author of Future Blue Chips and is on Twitter @BretKenwell. As of this writing, Kenwell held no stocks mentioned above. Article printed from InvestorPlace Media, https://investorplace.com/2018/09/strong-dividend-bud-stock/.